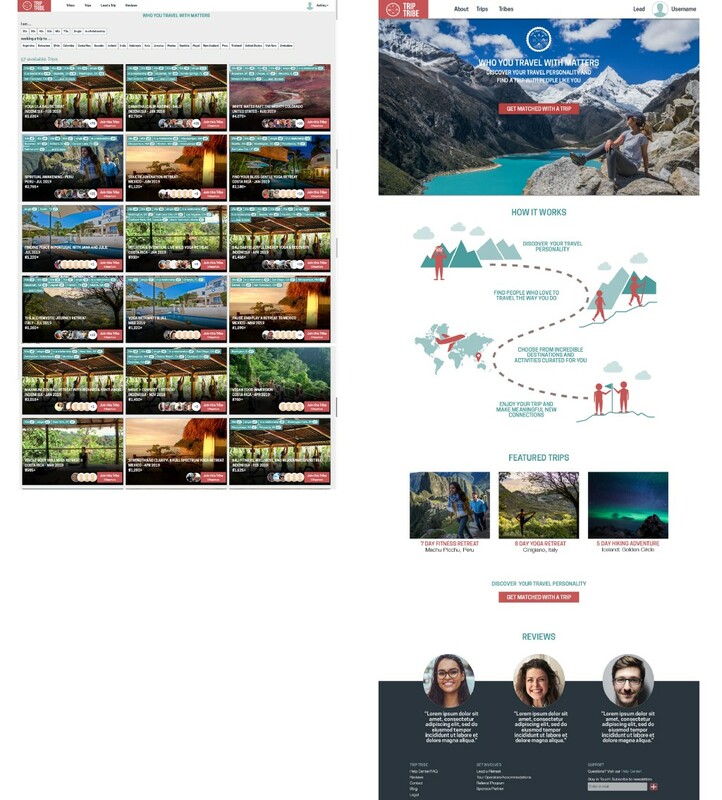 The founders of the travel website TripTribe tasked our team with improving their website for existing users, and identifying methods for targeting and capturing potential new users. TripTribe’s service provides high quality travel experiences by partnering with global travel partners, and focuses on connecting group and individual travelers with other people they would enjoy traveling with. TripTribe has a following of active travelers looking for new experiences, with a focus within the fitness and yoga community. The existing site focuses on matching individuals with similar travelers to optimize the trip experience. The founders of TripTribe asked us to consider a way to optimize the experience for matching people with like-minded travelers and optimal trips, while possibly identifying ways to expand the existing user base. We started with a usability study of the existing website. TripTribe has an established user base with repeat and loyal customers, so we wanted to determine what features were serving the user base well, and which ones could be improved. A user journey of the trip booking process as accessed from the landing page. The landing page did not seem to clearly and effectively articulate TripTribe’s value proposition of matching people with like-minded travelers. There is some clarification required to streamline the trip booking process by providing the right information to users at the right time. During the trip search process, users were not prompted to input key information into their profile which would aid in trip matching. The Tribes feature needed to be clarified and the value bolstered. The flow for becoming an ambassador or trip leader required clarification, including identifying the key responsibilities and benefits to leading a trip. In order to understand how best to enable TripTribe to appeal to a larger audience, we looked to user research and interviews to understand the travel habits and desires of potential users. We targeted users who traveled 2 or more times a year, and whose travel plans were not solely focused around family trips. Of 75 users surveyed, a third of them indicated that finding activities which would be amenable to all on the trip was the most difficult part of coordinating group travel, behind timing and budget. This indicated to us that matching users based upon type and strenuousness of activity was important. To an extent where you travel matters, but the people and experience matter more. 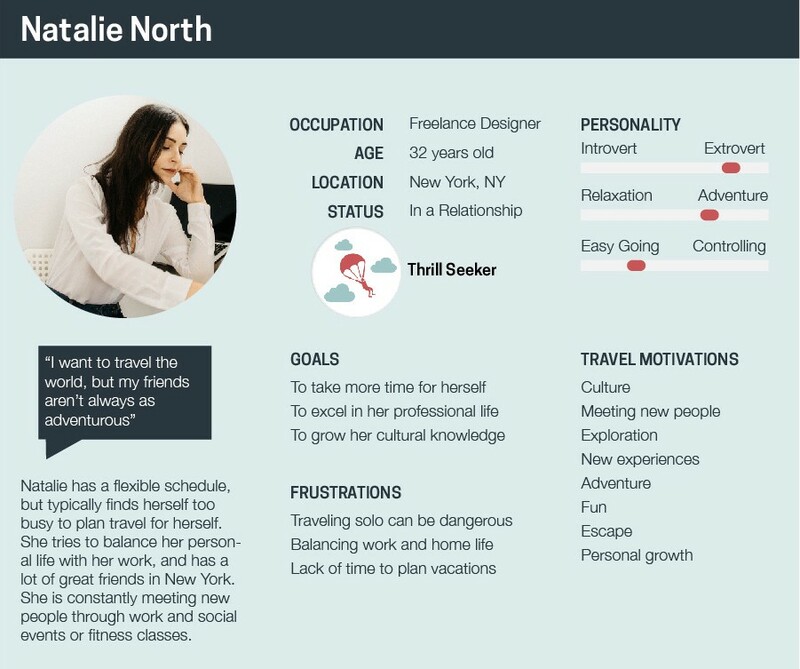 From our user interviews we derived our primary user persona, focused on a potential new user to TripTribe. We focused on designing to support this user type. Our primary persona based upon our user research. The study results shed light on how tourism professionals can use the BFF in marketing and designing their tourism products in enticing and satisfying different tourists having different travel personalities as well as different BFF of personality. The site currently matches people with trips based upon traveler factors such as age, location, and relationship status. While these factors our important, our team wanted to identify how we could match travelers based upon deeper meanings, and a better determinant of ‘like-mindedness’. Informed by our user research and secondary research studies, we developed a method of matching users to both trips and other travelers based upon ‘travel personality.’ Our travel personality was based upon two factors we determined to be most important from our user research: an evaluation of how intro- or extroverted a user is, and desire for intensity of activity on the trip. 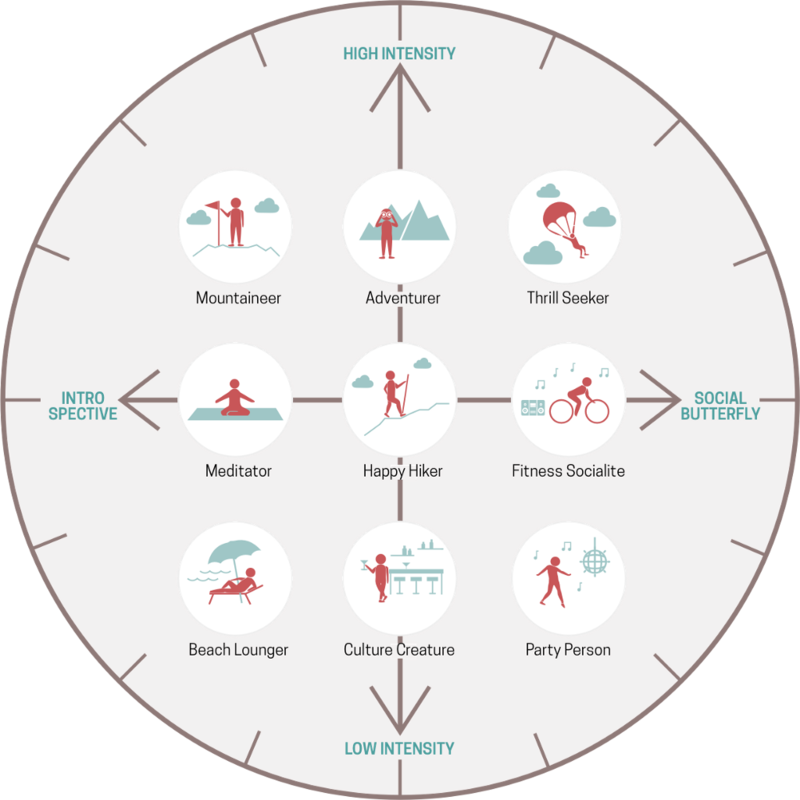 The identified travel personalities match users to trips and other travelers based upon their social qualities and desired level of activity. We also acknowledged users may identify with more than one travel personality, as one of the studies we read noted users identified with, on average, 3 to 4 travel personalities or styles. We developed a revised landing page which highlights the key value and mission of TripTribe’s service, including examples of their incredible trips. The landing page provides a clear point of access to matching new users with their travel personality and trips for them. 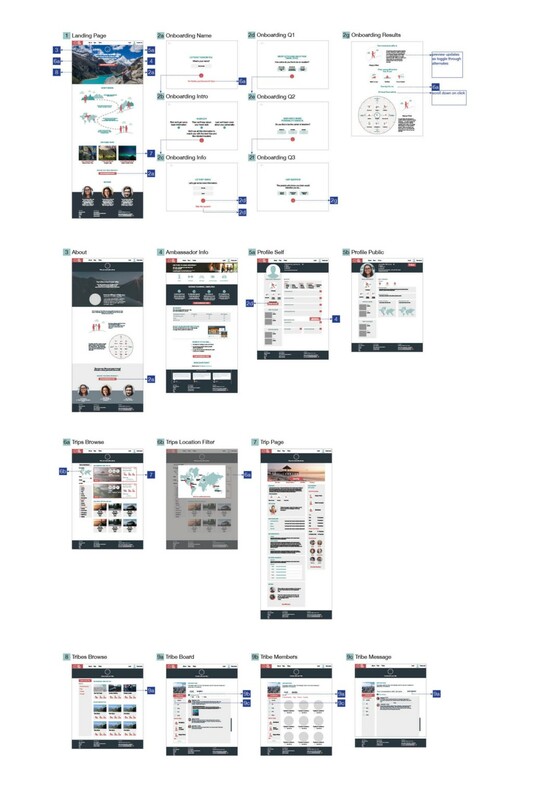 The existing landing page (left) and the new landing page (right). The new landing page clearly communicated TripTribe’s service and value proposition. We developed an onboarding process to match users with their travel personality, and to better match new users with potential trips for them. We tested two different versions of the onboarding process: one, which guided users through a series of questions to match them with a travel personality, an the other, which allowed users to simply select the travel personality and description with which they best identified. Two versions of the onboarding process were tested with users. 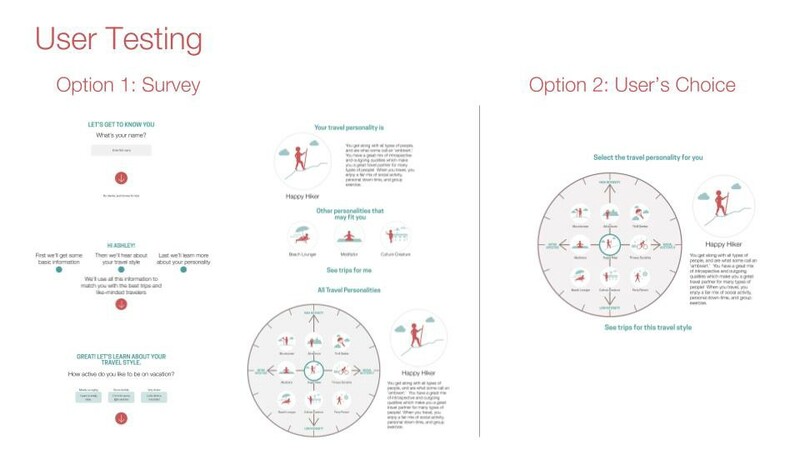 The survey version of the onboarding process was preferred by users, who indicated they felt they were matched with a travel personality based upon personalized questions and factors. We further developed the onboarding survey based upon user feedback, and created an animation to guide users through the process and clearly communicate the survey’s value. 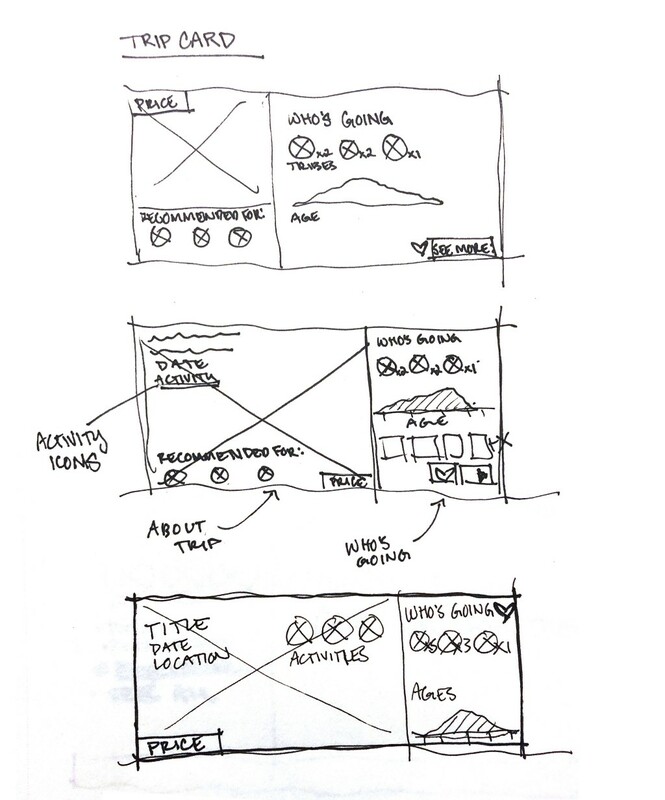 The onboarding animation guides users through the process, while communicating the service’s value. We reorganized key pages within the site based upon card sorts to better group information and prioritize the most important information. Sketching the trip card multiple ways allowed me to visualize the layout and organize information. The Trips page was organized to highlight ‘recommended trips’ for each user, based upon their travel personality. Features were added to the Tribes page to bolster the sense of community, including a ‘board’ feature, which allows users to find trips other travelers are taking as well as communicate local events within the community. The Ambassador page was clarified to include one page which communicates all the information required for becoming a trip leader. The key pages created for the project, with annotated flows. While we added a ‘board’ feature within the Tribes pages, it may also be beneficial as an internal board to trips for traveler communication before and after the trip. Studying and testing the ways to best bolster community engagement within the site would be a valuable next step for the site. TripTribe: a UX case study was originally published in UX Collective on Medium, where people are continuing the conversation by highlighting and responding to this story.